A huge pleasure to have this review from Dan Vyleta in The Walrus. Toward the end of Paradise and Elsewhere’s longest and structurally most intricate story, “The Ancient Siddanese,” an enigmatic tour guide to the ruins of a desert city invites the group to “close your eyes and explore Sidda by touch.” The narrator, an inhabitant of a near-future in which the sun has become humanity’s enemy, accepts the invitation and finds an unexpected perspective in his fumbling: that of a hypothetical interstellar tourist who discovers the dried-out planetary lump that was Earth and wonders at the creatures who left their marks on the dead world. The whole of Kathy Page’s beautiful, daring collection can be read as an invitation to seek out new points of view, with all the discomfort implicit in the act. The opening story, “G’Ming,” stages an encounter between what we so confidently call the “developing world” (as though its primary marker were stunted modernization) and the “developed world” from the point of view of a village boy, whose close observation of tourist behaviour is as shrewd as it is disconcerting. Like all the stories in Paradise and Elsewhere, “G’Ming” remains elusive about its precise setting, sabotaging the reader’s yearning for certainties. It sets the tone for a collection that moves seamlessly from realist accounts of the here and now, to dispatches from our imminent future, to the timeless worlds of myth and dream. It makes for giddy reading: each story’s opening paragraph an unlabelled door that may lead anywhere at all. In “Low Tide,” we find ourselves deep in Angela Carter territory, where fairy tales are reunited with their latent sexual content to take soundings of the treacherous depths of desire—Hans Christian Andersen’s “The Little Mermaid” reimagined as an abusive relationship between a lighthouse keeper and the creature of the sea he seeks to possess. The next story, “My Beautiful Wife,” is a realist portrait of an eastern European intellectual who is unsettled to find that the democratic revolution has brought in, among its stock of fresh ideas, emancipation; he witnesses his wife becoming other to him, despite his love. Attempts at communication across lines of gender, wealth, and even species; sudden changes in points of view and their implied reshuffling of certainties—despite the book’s many shifts in genre, protagonist, and setting, the collection has a startling coherence. Like children at a sleepover, tucked beneath shared covers, the stories whisper to one another, providing a thematic richness to the book that far outstrips its page count. 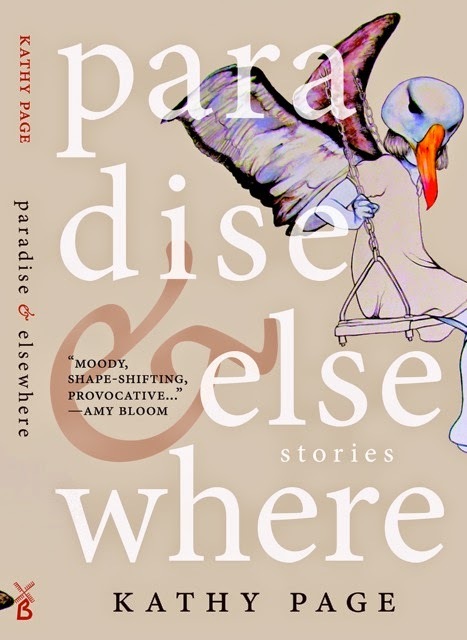 As with all good fiction, Paradise and Elsewhere helps us to see more clearly (though clarity is not without its dangers: in “I Like to Look,” the narrator literally observes her sister to death). The result is a collection that, while neither flawless nor comfortable, is always intriguing, often dazzling, and—for all the bleakness it unearths—immensely fun to read. Page has rebelled against the provincial assumption that we readers care only about the familiar and understood. “We must learn to talk to each other differently now,” Liia tells her husband in “My Beautiful Wife.” It is the awareness of this need that sets this fine book apart from so many others. Thanks to Kate Hargreaves at Biblioasis for this fascinating article on her creative process in designing the jacket for the US edition of Alphabet. What luck to have the book in the hands of a jacket designer who connects so strongly to the story, and even has two of its major elements inked on her skin! TNQ (The New Quarterly) publishes stories and poems by wonderful contemporary such as Caroline Adderson, Patricia Young, Steven Heighton and Mark Anthony Jarman; it was recently shortlisted for no less than five National Magazine Awards. The editors put each illustrated issue together in a beautifully produced book that does not fall apart when you open it, and chose an intriguing title that both connects and enriches the contents. So I’m delighted that my story, “To Make Much of Time” appears in the current issue, 123, The Time of Your Life, along with an essay, “Going Backwards”, that touches on the tricky business of writing fiction inspired by one’s own relatives and family history.